On Thursday, December 3, 12:00 – 1:00 PM, the Home Care Alliance will offer a one-hour virtual overview of the current home health IT utilization trends across the Commonwealth. Throughout the summer and fall, a team from the Massachusetts eHealth Collaborative (MAeHC) developed and distributed a statewide home health HIT adoption survey aimed at identifying and remediating gaps. The survey process, along with an action plan to increase HIT adoption among home health providers, will be presented on this webinar. Home health, along with other behavioral health and long term care providers did not receive incentives under the Health Information Technology or Economic and Clinical Health (HITECH) Act and American Recovery & Reinvestment Act (ARRA) which hospitals and eligible professionals have used to offset costs related to adoption health IT. The anticipation that new care and payment models, such as Accountable Care Organizations (ACOs), might support the cost of health IT adoption among “non-incentivized providers,” has been realized only in the most limited of fashions. While the industry continues to lobby for IT funding for long term care in future phases of “meaningful use,” The Alliance, in partnership with MAeHC and the Massachusetts eHealth Institute (MeHI), has taken steps to better position home health agencies to demonstrate their value proposition as connected partners. Please click here to register. https://attendee.gotowebinar.com/register/921473577991975937. The study conducted by the Massachusetts eHealth Institute (MeHI) shows that 74% of home health agencies have adopted a Health IT system, which places them behind primary care physicians, specialists and Rehab/Therapy, but ahead of skilled nursing facilities and behavioral health providers. The chart below displays MeHI’s results. Nearly 80 percent of healthcare institutions and practices in Massachusetts report they are using EHRs – and 50 percent of consumers indicated they have used health IT to directly communicate with their health care provider, review test results, renew prescriptions or schedule appointments. However, according to MeHI, this study confirms that there are medical practice areas in which the benefits of eHealth are penetrating at a rate slower than the statewide total. 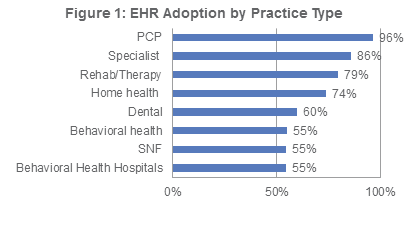 MeHI also found that ,of those with an EHR system, most practices and providers are using their EHR for medication reconciliation (81%), quality reporting (81%), electronic prescribing or eRx (76%). A smaller percentage of practices are using their EHRs for clinical decision support rules (64%) and public health reporting (55%). MeHI recommends state assistance for certain provider groups, including home health agencies, could benefit with accelerating the adoption process. For more on MeHI and their efforts to guide Health IT adoption, visit mehi.masstech.org. 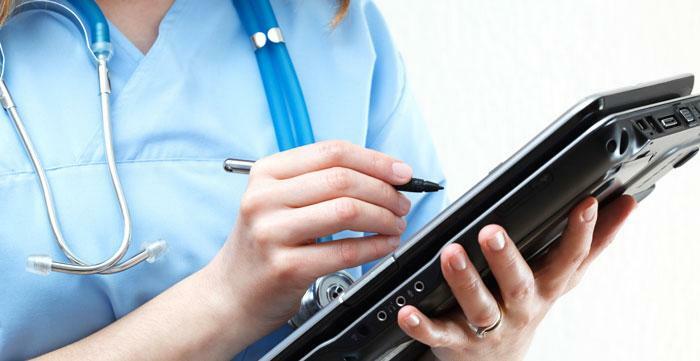 The Massachusetts e-Health Institute (MeHI) is hosting free regional meetings to help attendees keep up-to-date on how they can gain the benefits of connected EHRs and the Massachusetts programs to support their adoption and use. The sessions will include information about how MeHI, the Mass HIway and others are helping providers comply with Chapter 224 requirements for physician licensure and Stage 2 Meaningful Use. The workshop will take place in Worcester on November 4th and will run from 8:00am to 11:30am. The event is free, but registration is required. More information on registration and the agenda for the event are available here.